It’s easy to sell the idea of colorful flowers to homeowners, less so on the idea of leaves… or better said, fronds. Though ferns lack a true flower show, they do provide us instead with cool fiddleheads early spring and awesome season-long texture. Plus, they have a pretty long history – fossils have been found that date back 145 million years for current families and species. Choosing the right fern will depend on the light and soil conditions the site has. Many think they only grow in deep shade, but what most fern want is dappled light. Planting in conditions similar to their natural settings is the goal. Most of our native types grow along the edge of the woods where they receive early or late-day sun or in pockets where the forest opens up and sunlight streams in during the day. As far as their favorite soil conditions go, we can mimic that – think: loose and rich. Amending existing soil with garden compost is ideal to help improve soil tilth. Mixing in some pea gravel or even some sand helps to loosen the planting medium which means oxygen can reach the roots – something Mark likes to stress! We all know that ferns are a natural choice for shady, non-bed areas where not much else will grow, but don’t hesitate to try some in your next perennial bed or mixed border. Many of the non running-types will do great, providing the bed with season-long interest. Some good companions to ferns include Lily of the Valley, Bleeding Hearts, Lenten Rose, Hosta, Creeping Phlox and many more. 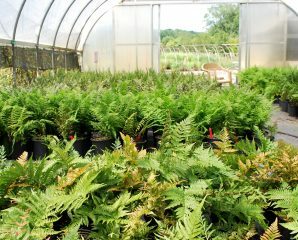 Take a look at our fern selections below – all PC Grown plants in 1 gallon containers. Japanese Painted Fern (Athyrium nipponicum var. pictum) Very popular fern due to the variegated silver-gray fronds with maroon stems, one of the most widely used ferns in the U.S. You’ll get the best color when its planted in light shade. Under ideal conditions they will continue to send up new fronds all summer and into the fall, so they can look nice and fresh all season. Once a large clump forms you can easily divide it in quarters with a spade -there are good chances you’ll get several growing tips in each clump. Grows 8-20″ tall, zone 4-9. (An interesting cultivar that we currently have in stock is called ‘Ghost‘. The upright silvery fronds show up nicely and combine easily with so many other plants.) Also available ‘Godzilla’ which will grow 3′ tall x 4-6′ wide!